Lots of great games cheap for steam on Humblebundle.com check it out! Araya_koko is celebrating their birthday today! Decoy1982 is celebrating their birthday today! imaidiot is celebrating their birthday today! DatBoiTreezy is celebrating their birthday today! SaucySlingo is celebrating their birthday today! Large Coffee is celebrating their birthday today! My first gaming console was a Sega Genesis. I remember the day opening up that Christmas preset to see 16- Bits of High Definition bliss. Those were the days when a game came with the console. That's where it all started. Sonic the hedge hog, Golden Axe, mutant league football, and more were my escape. I still have my collection of games and the original Sega. Some of which I continued to collect through my years working at Game stop. 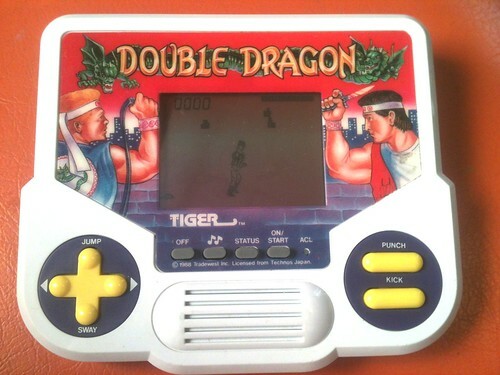 For hand held games I can remember my original game boy, game gear, and the simple tiger LCD double dragon (https://c2.staticflickr.com/8/7005/6701812017_06c65950f7.jpg) and others you would play till the batteries died. My Mom usually picked these up for me in the duty free shop at the airport for the long trips to Ireland in the summer. When I first got the original game boy I remember Tetris, Kirby's dreamland, and teenage mutant ninja turtles. I would play tetris all night long with that song burnt into my brain for eternity. For the game gear I would pay Shin-obi and Sonic all night with the glowing screen from six AA batteries. From there I moved on to Nintendo 64 which was some of the first games I could sit down and devote months to such as Mario 64, Legend of Zelda and the Ocarina of time, Mario cart and golden eye. This was a big step in my gaming life since it introduced four player games. I remember playing my cousins during all the holidays and never wanting to stop. This is also the period where a lot of family memebers would refuse to play me due to my win streaks. Not to tute my own horn since none of them were real gamers. Once the N64 console ran its course I remember my dad coming home with the Xbox (original). This is where I feel I became a true gamer. I was old enough that I needed to get a job to be able to purchase my own games. I remember going into Game stop where my friend worked to buy Halo Combat evolved. My friend said to me you should apply for a job her since we get a discount on games and it would be great to work together. I talked to the manager, told him what consoles I had and my past experience with games and he hired me on the spot. "Can you start tomorrow?" He said. I was in shock, my first job and I started the next day. I took the job and went home to start my Halo journey with my best friend. The next day I began what I feel was one of not the best job of my life. We got to try all the games out with an incredible discount. I would help people figure out what is the best game for them or for their family member. I was surrounded by everything I loved. I later bought a PS2 and Gamecube just to complete the trifecta. I remember playing Socom online which was truly a test of my gaming skills. I also remember doing Halo through Game spy's gaming network using LAN gametypes prior to LIVE. Shortly after LIVE became available and made my life much easier. I would have the full term subscription to Xbox live but my first year was lost when I got another starter pack for a present and it made me create a new gamer tag so now it only shows that I have had Xbox live for 9 years rather than a full 10. I know deep down inside that I have had Xbox LIVE since its inception. In college my girlfriend (now wife/baby mama) bought me a Xbox 360 for my 21st birthday. This Xbox I feel really improved the Xbox LIVE experience. Halo pretty much ruled my life at the beginning of the consoles life cycle. I remember gears of war being a revolution for me with a whole new view of a shooter. The Xbox One is defiantly one of the consoles that I played the most games on but now with TSA steam is now a close second place. Xbox was the first console that got me into achievements. At the beginning I was not really into achievements until I started my work in the Medical Tech field where a coworker started comparing games, completion %, and overall scores. This is when I was first introduced to TA. Since then I have grown made friends, attended gaming conferences, participated in gaming completions, and moved on to yet a new generation of gaming consoles. I now find myself with many consoles all displayed and ready for a new generation of gamers to play. I feel I will make my son play through the games in the same order I did to have him truly appreciate how games have progressed.